When Mrs. Rose Marie Eichhorn Wittenberg of Little Rock died in 1961, she left her belongings to her son Walter Wittenberg Jr. 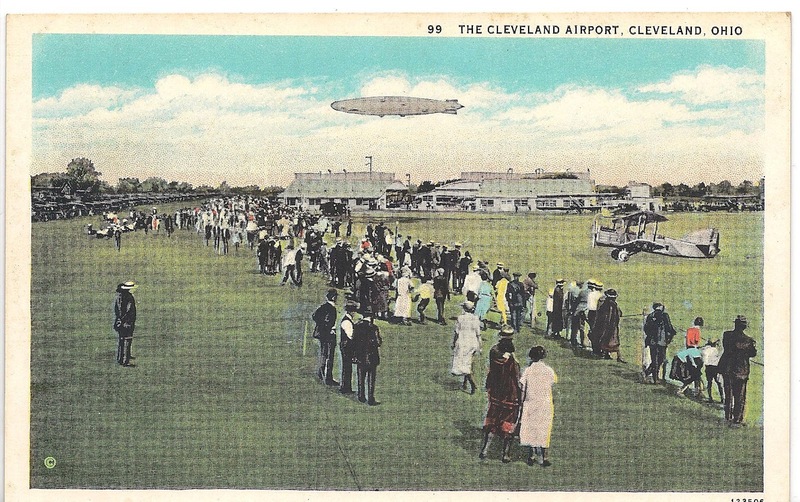 Among the things he inherited was an album of postcards from the 1890s through the 1930s. Not long after Walter Jr. died in 1976, Mrs. Wittenberg's postcard album was sold at a garage sale held in the Hillcrest area of Little Rock. I purchased it. 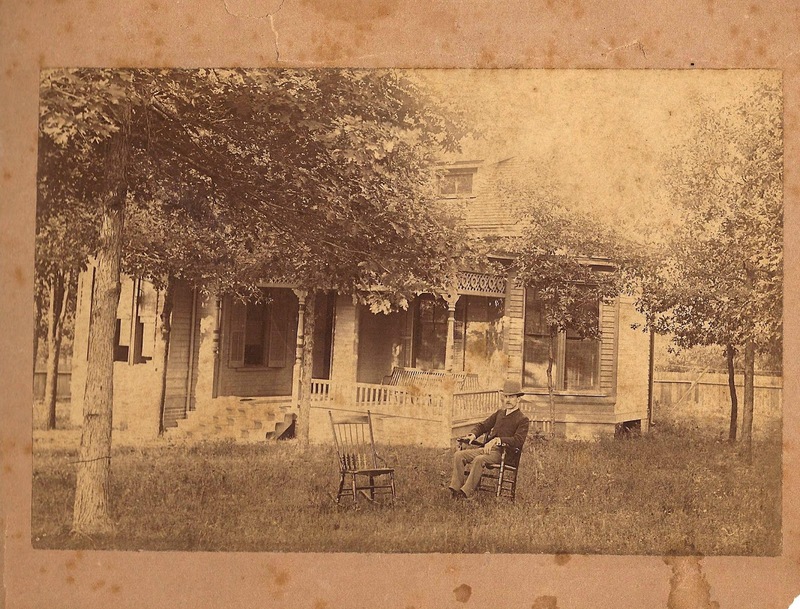 The short version of their story is this: Walter Wittenberg arrived in Little Rock in 1865 as a soldier in the Union Army's quartermaster service. Born in 1834, he had come to the United States from Germany with his parents in 1849. They had settled in St. Louis, and he had married in Annie Libby in 1856. 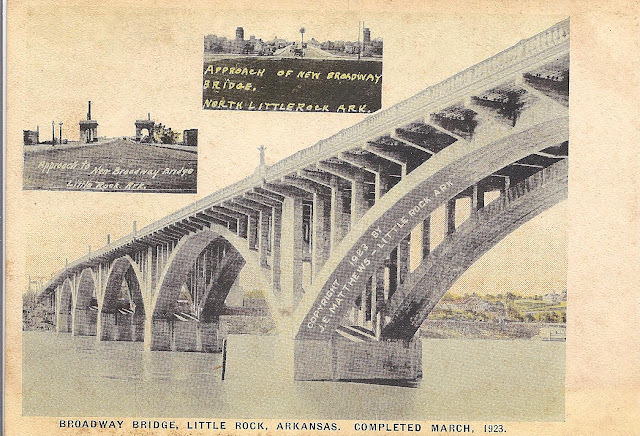 After the Civil War, his wife and son (Frank) had joined him in Little Rock, where he made a successful career as an accountant, book keeper, and banker. In 1869, he had helped created the first building and loan association in Arkansas. 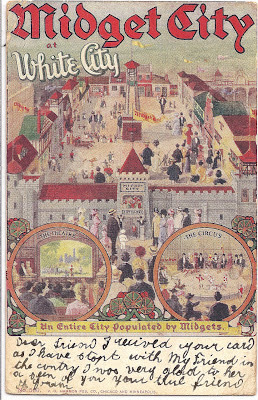 Wittenberg, who had a big house at 518 Broadway, lost his wife to illness in 1883. They had six children together, two of whom died at very young ages and one who died as a teenager. His oldest son, Frank, was a successful accountant in Little Rock, and Frank's son, George, started an architectural firm that still exists. Marie Eichhorn was born in Saxony in 1877 and spent most of her first thirty years in Dresden. She made two trips to the United States (in 1892 and 1908) before moving here permanently in 1911. She and Walter married sometime in 1911 and had a son, Walter Jr. 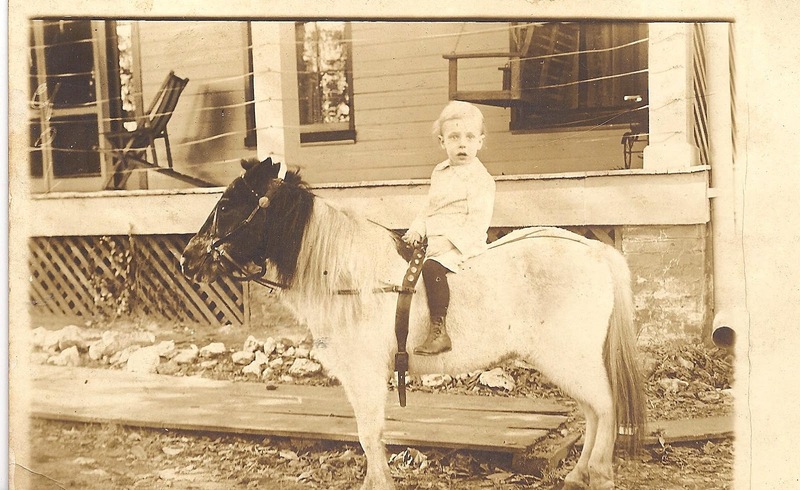 The senior Walter died suddenly on October 11, 1912. 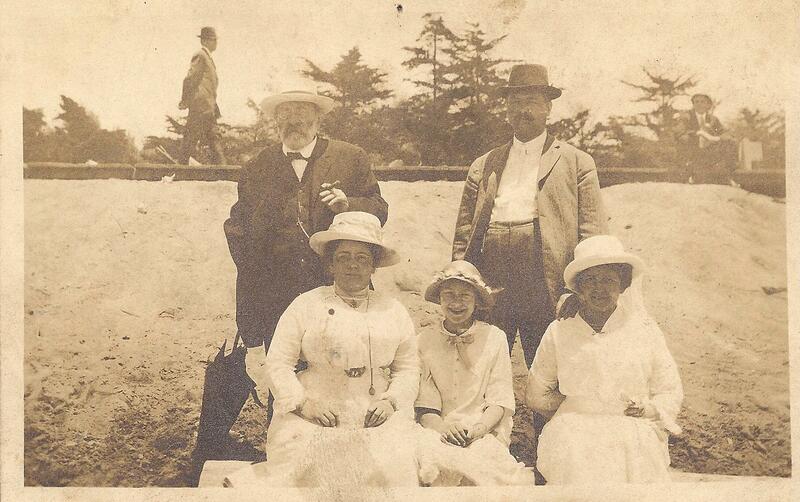 Eight years later, in December 1920, Marie married James E. Hogue, a Little Rock lawyer. They divorced in June 1924, and Marie reclaimed Wittenberg as her last name. She moved from the house on Broadway to a house in the Hillcrest area of Little Rock in the middle 1920s. After a couple more moves, she settled at 412 Palm Street, where she lived until her death in 1961. For many years, she attended the First Lutheran Church in downtown Little Rock and was secretary of the women's auxiliary group. At the time of her death, she attended Grace Lutheran Church. 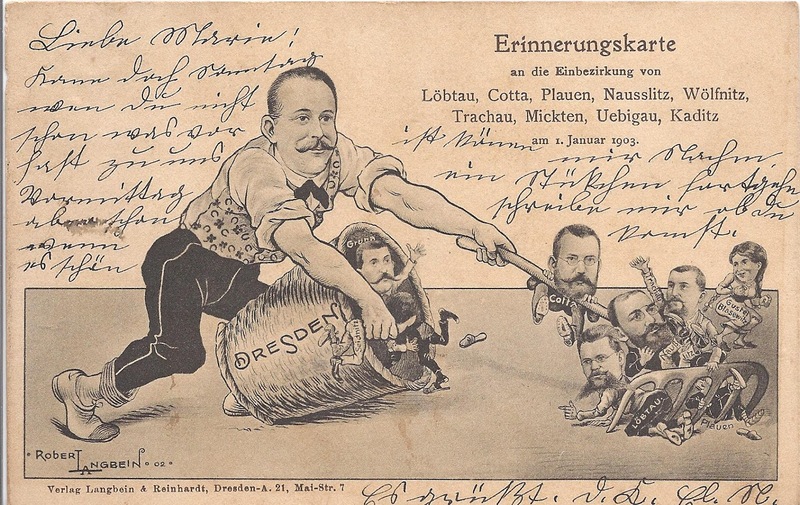 The postcard above celebrates an arts festival held in Dresden in 1905. 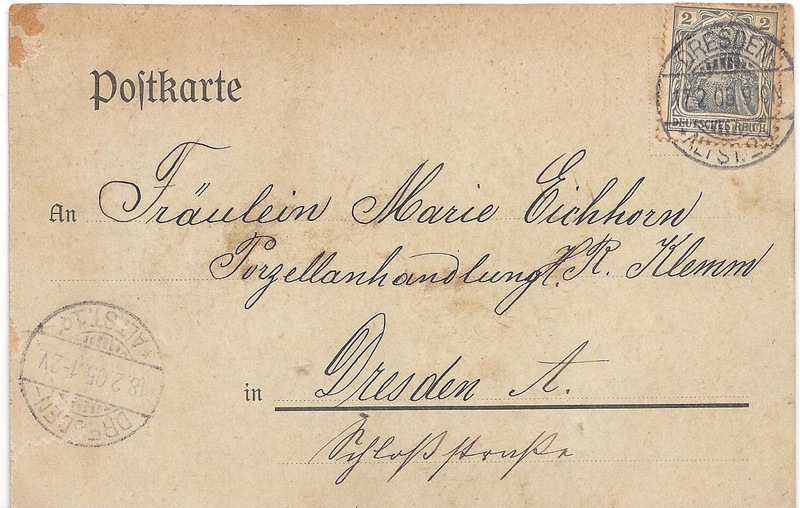 This postcard shows Marie's address in Dresden in 1905 and her interest in the arts. This postcard commemorates a political event that occurred in Dresden on January 1, 1903. Apparently that year a political figure gathered a group of politicians to support him. 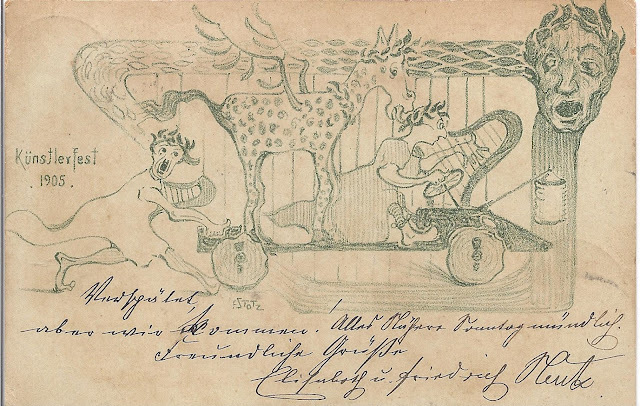 It was mailed to Marie Eichhorn in 1906. This unmailed postcard shows the King and Queen of Saxony, which at one time was a kingdom. King Albert held his position from 1873 to 1902. Dresden is located in Saxony and Marie Eichhorn lived there during most of her first three-three years of life. 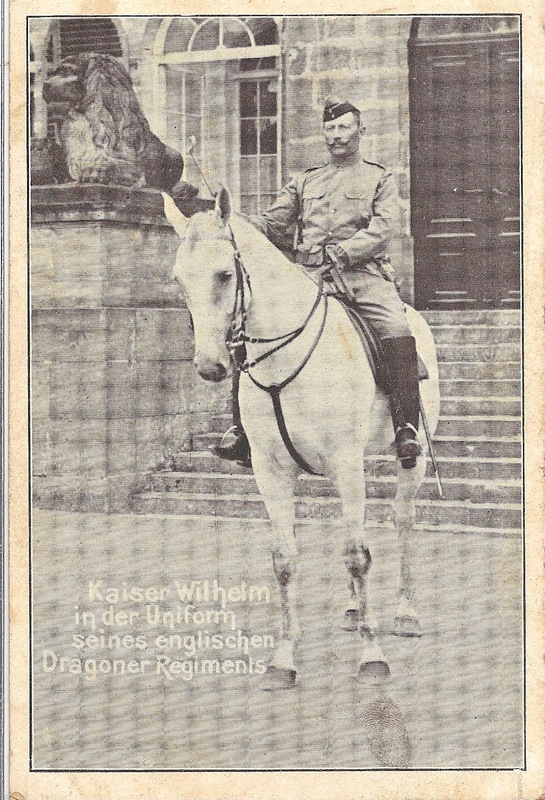 This pre-World War I postcard shows the German Kaiser. The postcard is unused. 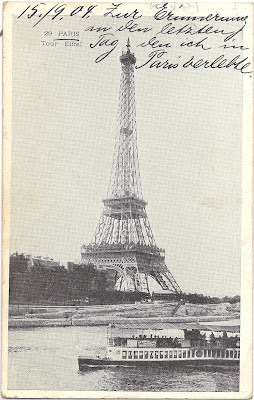 This postcard apparently was mailed by Marie to herself as a memento of her visit to Paris in 1904. 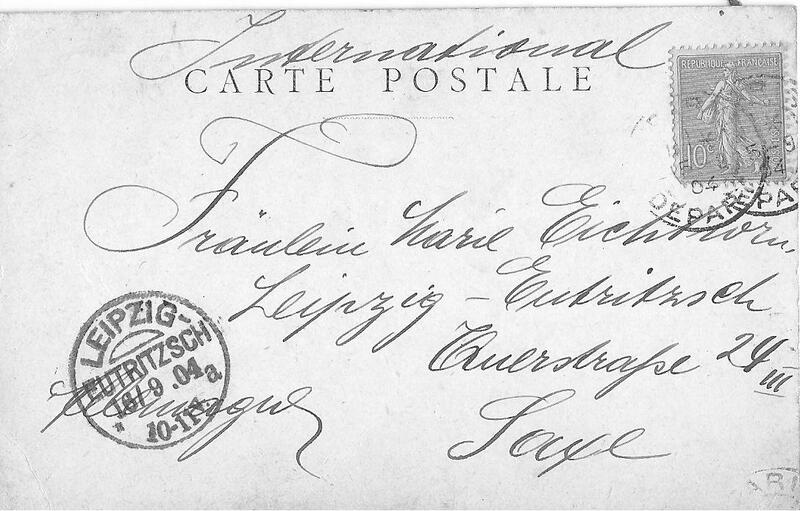 On the front is written: "In remembrance of the last day I was in Paris." At the time, she was living in Leipzig. This postcard was sent by a young lady in the United States whom Marie had met during her travels. It is dated 1906. 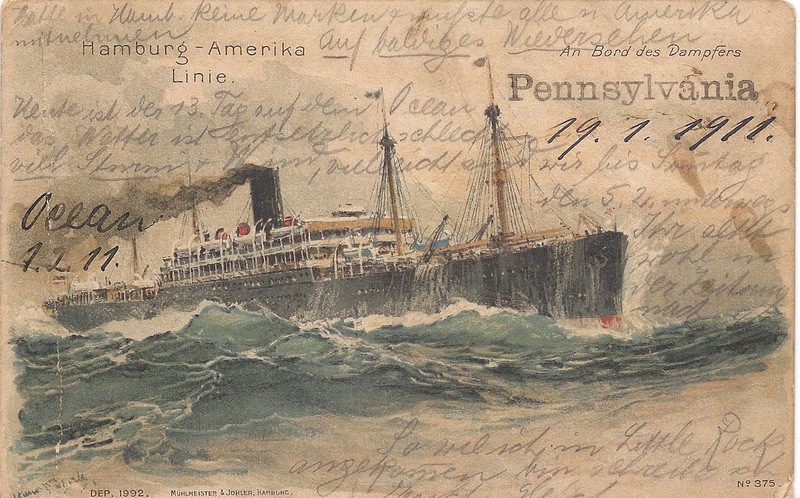 This postcard is one of two that were given to Marie by Walter Wittenberg. On the back is written: "Received in Dresden from my dear Walter." This card documents the fact that Walter visited Dresden, probably in 1910. Marie's 1911 trip to the United States is documented in this and another couple of postcards. The writing on the front says that February 1, 1911 was her 13th day on the ocean and the water has been terrible with many storms. She expected to land on February 5th. Marie had a sister, Hedwig, who lived in Cleveland. 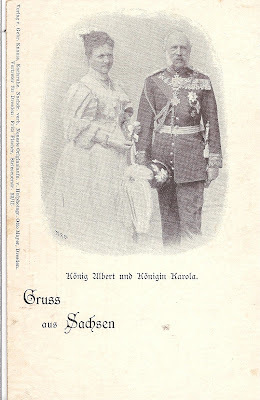 She had married Michael Weinhauer in 1895. 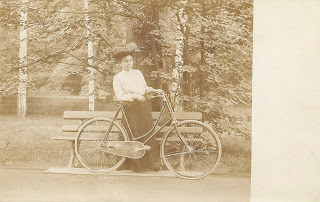 Hedwig died in Spring, 1912, but Marie kept in touch with her children. 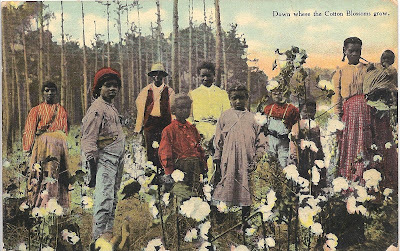 Several of Marie's early postcards were sent to her by Hedwig, and several of the later postcards were mailed to her by Hedwig's children. This is an unused postcard. 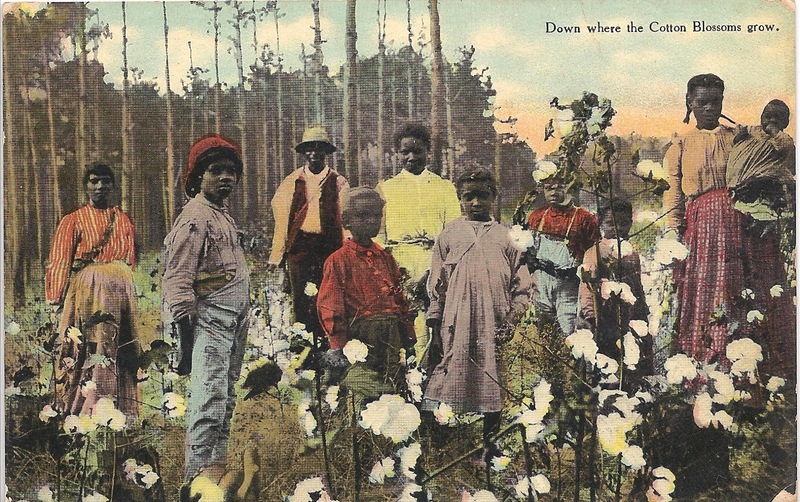 Several of the postcards in Marie Wittenberg's album have pictures of Arkansas in the 1910's and 1920's. This is an unused postcard in the collection. 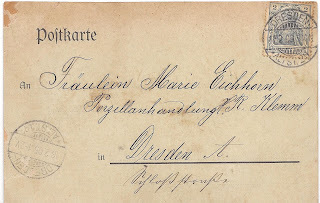 The three postcards above are real picture post cards (RPPCs) in Marie Wittenberg's collection. Unfortunately, they are unused (thus, no address) and have no names associated with them. Perhaps the one at the bottom is Walter Wittenberg Jr. as a child. 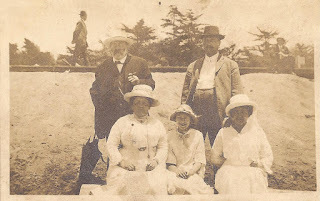 This final picture is not a postcard, but a photograph that came with them. 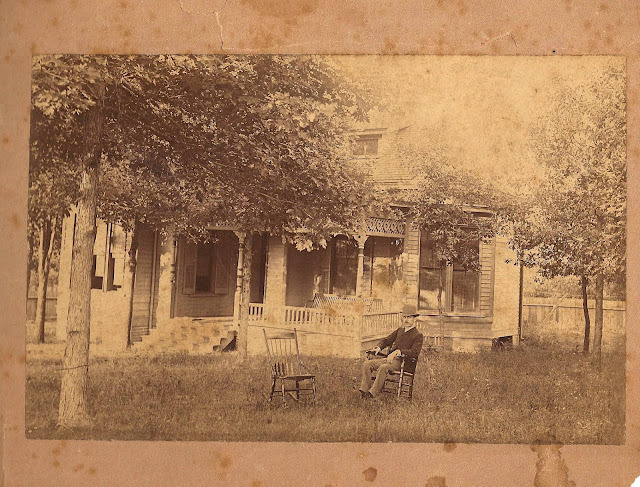 Perhaps it is a photo of the Wittenberg house at 518 Broadway, Little Rock. No identifying information came with the picture.